MBA study programme specialization. Specialization will be indicated in Diploma supplement, which will be conferred to graduate together with MBA Diploma. MBA study programme graduates obtain diploma conferred by the Jagiellonian College in Toruń, Faculty of Administration and Economic Studies in Uherské Hradiště with reference to relevant field(s) of study. Graduate is entitled to use professional qualification “Master of business administration” (MBA). Together with the Diploma, Diploma supplement will be conferred, which recognizes field(s) of study of MBA study programme, undertaken study modules, MBA Thesis title and name of the supervisor. Master of Business Administration (MBA) is international managerial study programme, which is not included into tertiary education system of the Czech Republic, according to Act about tertiary education. We provide our MBA study programme in the Czech Republic with respect to the status of foreign tertiary education institution subsidiary. MBA study programme of Jagiellonian College in Toruń is internationally acknowledged. MBA study programme has a standard length of one term. Start of the study is individual, in accord with study application registration. Study is held in distance form (online). Conditions for successful graduation are connected with particular study modules graduation, preparation and dissertation of MBA Thesis. MBA Thesis is prepared by the student with assistance of supervisor. Faculty of Administration and Economic Studies designates the supervisor, with respect to MBA Thesis topic. Price of the study is 39 000 CZK (VAT not included). The Faculty of Administration and Economic Studies is not VAT payer. MBA study programme is under the authority of internal act "Directive for MBA study programme in distance form". In case of your concern, you can easily fill in given application form. You can make your own decision, whether to use immediate online application or download application form in Word and sent fulfilled form via e-mail. You can easily fill in the form and sent. We will confirm your application as soon as possible and provide further information and following steps. The faculty of Administration and Economic Studies in Uherské Hradiště is a subsidiary of Jagiellonian College in Toruń, Poland. 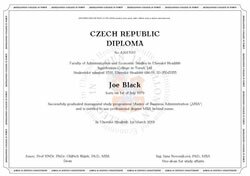 Faculty was established in the Czech Republic with respect to Act 111/1998, Act about Tertiary Education Institutions, through the registration to information duties fulfilment. These information duties respects the status of the Faculty as foreign tertiary education institution subsidiary. Status of the Faculty, its legal identity and activities are legal and transparent, as well as the subjectivity of other faculties and tertiary education institutions in the Czech Republic. 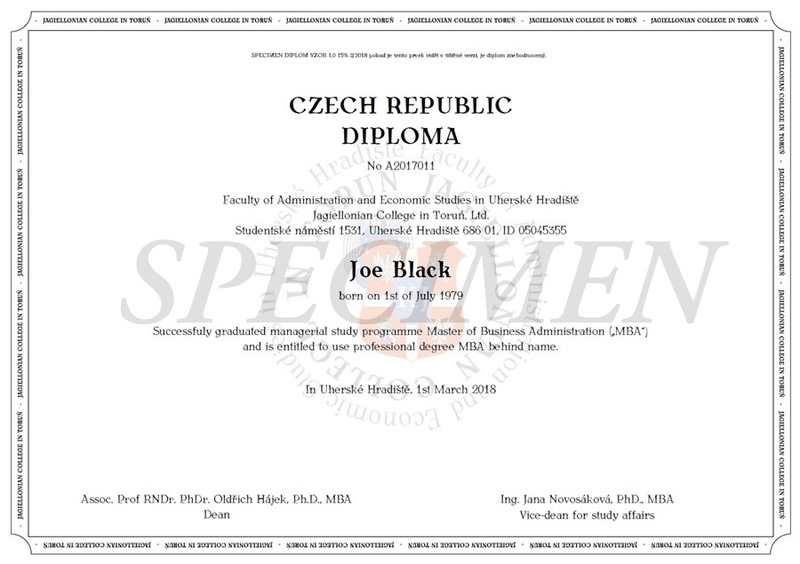 Academic and professional degrees are equal to these, conferred by the Czech colleges and universities. It is not obliged to acknowledge or verify them. Further details are provided by the International Treaty Code 104/2006. Jagiellonian College in Toruń, Poland, has accreditation rights including study programmes related to corporate management, public sector administration, administration and economics, pedagogics, inner security, international relations and informatics in management. Study is designed to follow key knowledge, competencies and abilities development. Cooperation with praxis is highly supported. Graduates are equipped with competencies and abilities which meets the requirements of modern labour market. Jagiellonian College in Toruń has recently more than 1,000 of students and more than 10,000 successful graduates. Jagiellonian College in Toruń provides the offer of further education and is engaged in international cooperation. Realization of MBA study programmes is embedded in long-term experience of Jagiellonian College in Toruń. 2018 Copyright All Rights Reserved. Faculty of Administration and Economic Studies in Uherské Hradiště Jagiellonian College in Toruń.